Apple has posted a list of 12" PowerBook of manuals available in PDF format. CPU: both 700 MHz and 800 MHz iBooks were faster than the 12" PowerBook (However, I've been informed that omne reason that the iBook seems faster than the 12" AlBook is that the iBook doesn't do the "AltiVec" test under the "CPU" category in Xbench). Disk: The 12" PowerBook faster, but the 700 MHz iBook was faster than both of the 800 MHz units. Memory: The 12" PowerBook trounced the G3s, as it did in the OpenGL and Quartz tests. However, in the Xbench Thread test, all three iBooks beat the 12" PowerBook. PiXel Check is a utility that allows you to easily turn on all or specific pixels on your LCD display, allowing you to check for bad or dead pixels. Click the mouse button or press any key to dismiss a test, or jump to the next color in the "Automatic" mode. Multiple monitor support! There are no options to select; it just magically detects your extra display(s). Help (English) is now available from within the application. Added Italian localization, thanks to Max Rotunno. Cleaned up more code and corrected a description faux pas relating to Black and White test modes. Oops, someone baked their PowerBook G4 at 400 degrees for 20 minutes. The machine still booted, video and all. Aaron Steele has posted photos. High End Communications of West Nyack, NY, is offering a new Apple Laptop Repair service built for customers from around the U.S. who need 'Book repairs done quickly. For a set price, High End Communications covers 3-way shipping (box to customer, laptop to office, and laptop to customer) and a diagnostic report within 24 hours. High End Communications specializes in Apple Computer training and service and is an authorized Apple Reseller & Service Provider. The company was founded in 1996 by a small group of college students attempting to make some extra money to pay for the large bills that being a college student involves. Offering top notch service around the country, the staff of High End Communications says they're here to show you what you should expect from any service provider you work with. Their staff of technicians have all met stringent guidelines that include but our not limited to ACTC & AASP (desktop and laptop) certifications. MacResQ has announced a new Canadian repair service as part of their PowerBookResQ repair program. The new service offers Canadian PowerBook and iBook owners an affordable source for service parts and labor with PowerBookResQ's famous quick turnaround and convenience. PowerBookResQ addresses the difficulty that most users face when they encounter a technical problem with their PowerBook. Users of older PowerBooks face a tough challenge trying to find a local source for older parts and service. If a local repair center is available, costs are usually high, and turnaround time is unacceptable for users who rely on their PowerBooks on a daily basis. Users of newer PowerBooks and iBooks often have no choice but to send their systems back to the manufacturer for an expensive repair due to parts limitations and service policies. The PowerBookResQ program solves these problems by offering fast, safe, and reasonably priced repairs for PowerBook and iBook owners. Customers start by visiting http://www.powerbookresq.com/canada.html or calling the toll-free number, 1-866-Mac-Repair. After just a few questions, MacResQ dispatches a custom-designed "PowerBox" (built to insure safe transit for all PowerBooks) to the customer via express courier. Upon receipt of the empty PowerBox, the customer simply slides the PowerBook into the container and attaches a preprinted shipping label. A quick, toll-free phone call brings a courier to the customer's location for express shipping back to MacResQ. A MacResQ technician conducts a thorough diagnosis and contacts the customer with a detailed repair estimate. The repair is usually completed within 24 hours and the PowerBook is returned to its owner via express service. The cost of the new PowerBookResQ Canada service is CDN$179, accepted in U.S. or Canadian funds. This includes the 3-way express shipping, the initial diagnostic service, and the PowerBox, which the customer may keep for future use. PowerBookResQ service remains $99 for U.S. customers. "PowerBookResQ is the only repair center offering nationwide service combined with 24-hour turnaround for PowerBook and iBook owners in the U.S.," said Shannon Jean, President of ResQ Systems, LLC. "We are thrilled to extend the service to our customers in Canada and, despite the increased shipping rates, to be able to offer the service for just US$12 more than our standard rate. PowerBook and iBook owners in Canada will now have an alternative to the high prices and unacceptable delays at their local repair shops." For computer resellers and repair centers, PowerBookResQ offers discounted rates on products and services. Computer dealers can send overflow service work or seamlessly outsource their entire PowerBook repair operation. Volume discounts are available for schools, corporations and government agencies. 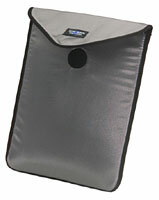 The Mitre laptop sleeve from Tom Bihn is designed to protect your laptop from scrapes & scratches. Slide your computer inside and then put the whole affair into your briefcase or backpack. Velcro® closure & cool Titanium color. In sizes 4 (for the 15" PowerBook G4) and 1 (for the 17" PowerBook G4). Made in Montana. Exterior dimensions: 12" x 15.75". Fits smaller, thinner laptops such as the PowerBook G4 and the 12" Apple iBook. 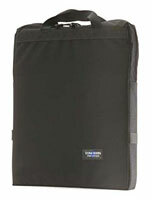 The Monolith - now available for preorder in Size 1 for the Apple PowerBook G4 17" - provides all the super-tough protection of Tom Bihn's Brain Cell, but in a vertical orientation. Designed specifically for use inside our newest daypack, the Smart Alec. If you already have a favorite backpack, chances are the Monolith will fit inside of it, too. Unlike its landscape cousin, the Brain Cell, the portrait Monolith has no shoulder strap attachments or pocket, so it is just useful as protection. Please note: in order to get the most laptop protection from the Monolith, it must be carried in the vertical (or "portrait") format. Therefore, it is best to use this bag with your favorite backpack. If you require a protective laptop case to use with a briefcase or shoulder bag, in a horizontal (or "landscape") format, please see Tom Bihn's Brain Cell. Valence Technology, Inc., a specialist in the development and commercialization of Saphion technology and Lithium-ion polymer rechargeable batteries, has announced that it has selected MCE Technologies, LLC, a leading manufacturer and authorized reseller of innovative products for the Apple PowerBook and iBook, to distribute the N-Charge Power System. "MCE is the premier provider of solutions that support the Apple brand, and we are extremely pleased that MCE has chosen to add the N-Charge system to its Apple compatible product offering," stated Stephan Godevais, chairman and chief executive officer of Valence. "MCE's strong position in the Apple market makes it the partner of choice for us as we continue to expand our distribution network and target top tier channels such as Apple." Arnie Ramirez, president of MCE Technologies, LLC said, "We are always on the quest for emerging products and technology for the Apple PowerBook and iBook, and Valence's N-Charge system meets our needs perfectly. The N-Charge is a cutting edge solution that offers our Apple customers something they all need: complete mobility and extended power." The N-Charge system will be available beginning February 16, 2003. With top secured DES 64-bit/40-bit key strength, the SuperGuard3 provides extra protection for your data. Even if the entire drive is stolen, no one can read your data. SuperGuard3 is a cutting edge technology product that offers military grade protection for your important data. Unlike software passwords or smart cards, SuperGuard3 provides a silicon based real-time encryption/decryption solution capable of maneuvering 66MB/sec throughput without using any system resources. SuperGuard3 is the top notch choice for banks, insurance provider, government agencies, health care, and intellectual property developers to protect their sensitive data. With high-performance FireWire-1394 and USB 2.0/1.1 bridge adapter built-in, the SuperGuard3 can easily convert an IDE hard drive into a FireWire and USB 2.0/1.1 interfaced external device. The SuperGuard is expected to be available Feb. 7, 2003. Retail price is $139.